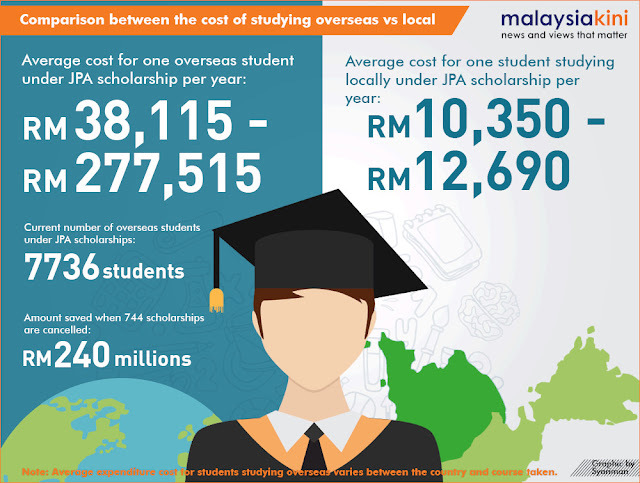 The government saves RM240 million a year by cancelling 744 scholarships for overseas studies. This is an average RM322,580.65 per student, a written parliamentary reply today revealed. This far exceeds the cost of sponsoring a student for tertiary studies in Malaysia. Minister in the Prime Minister's Department Azalina Othman in her written reply, said it costs up to RM12,690 to sponsor a student at a local varsity. Overseas scholarships cost at least RM38,155 a year, depending on the course and country, she said. There was wide public outcry following media reports that the Public Service Department was cutting overseas scholarships. Critics of the move said it widely affects non-bumiputera students who cannot afford to self-fund their studies at top universities abroad, while bumiputera students can still seek funding from agencies like Mara.